Linda Cooper could never escape from her parents - even when she was at school. The now 49-year-old attended St Mary’s junior and senior schools in Leyland, following in her dad’s footsteps. Michael Sheridan, who died last year, was a pupil at the school in the early 1950s, with Linda going in the early 1970s. Her mum, Eileen, was also a dinner lady at the school whilst Linda and her two siblings were there. Linda says: “My dad was born in Leyland and spent his life here. “As children, we were brought up as Catholics and so we went to the nearest Catholic school, which was St Mary’s. “I don’t think the schools had changed much from the time my dad was there and when I was. 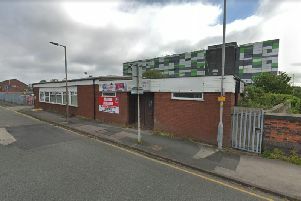 “The schools were based in Royal Avenue and School Lane. “I couldn’t really say much about my dad at school, but I think he was a bit of a mischievous boy. Linda recalls her days at the school and how her mum being there meant she had to eat her greens. She says: “It was good having mum there, but she didn’t let us get away with not eating the school dinners. “The other kids used to ask her to take away food they didn’t like so they didn’t have to eat it, but she refused. “But unbeknownst to her, she would find food, like sausages in her pockets as they hid them there without her looking. “She was there when my younger brother, Christopher, and sister, Carol, were there. “Carol is now a teaching assistant at St Anne’s. It was while at school, Linda found her love of art, where she even won a prize. She recalls: “I used to love art and I won an art prize at junior school. “I also used to enjoy playing rounders on the field which is where the proposed Aldi would go. “I was also in the choir with the girls and remember practicing in the school hall. “At junior school we went on a trip to London, and at senior school we took a trip to France on the ferry, which was great fun.